Loving Chick Fil A? Yeah, that’s one of our deeply held, core beliefs. 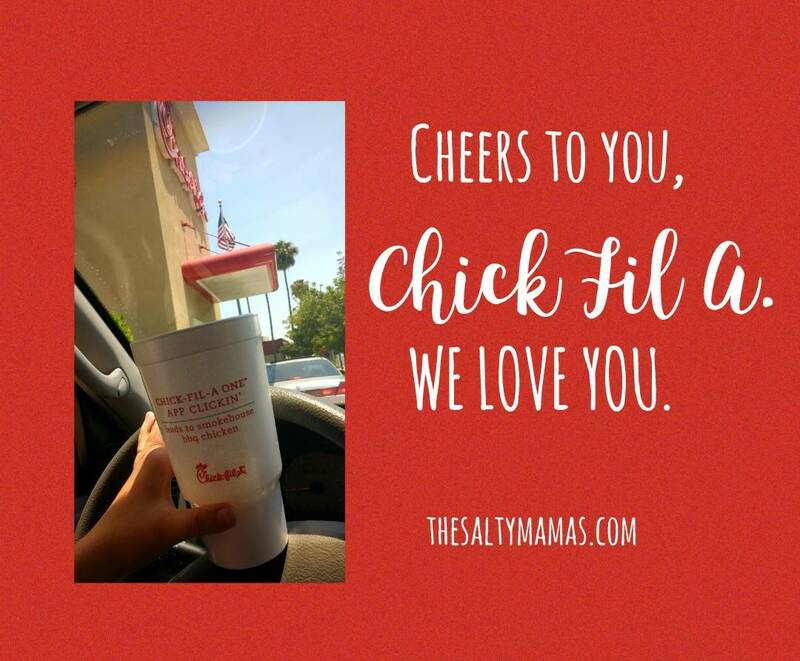 There has been MANY a day where the only thing that gets us through is the promise of a trip to Chick Fil A…and I’m talking about the Mamas, not the Little Salties. 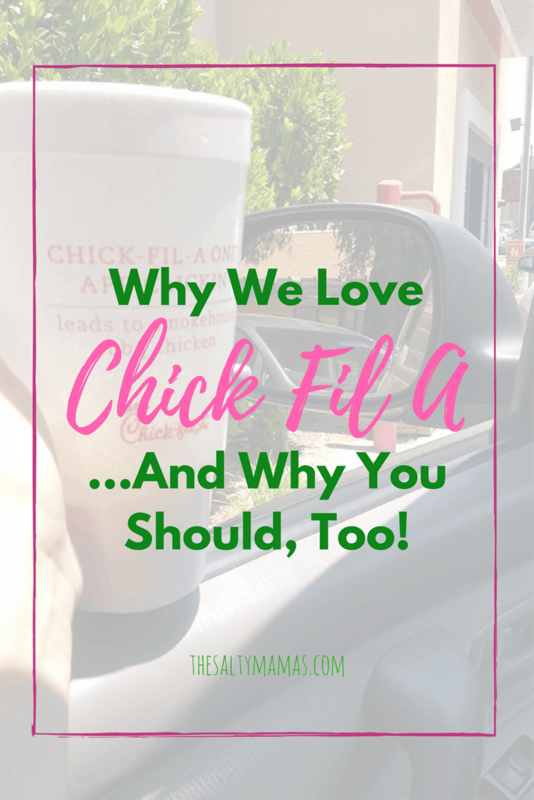 So what is it about Chick Fil A that we love so much? We’ll do our best to put it into words. Jaymi: Diet Coke. Limitless, endless Diet Coke. Christine: Cherry Coke. ALL the Cherry Coke. And one for the road. Jaymi: Abe is finally old enough to go into the play area. Lila takes him into it and helps him through the structure and tells off any kids that mess with him and it makes my heart BURST. Christine: The play area is SOUNDPROOF. Like, I can only hear the most extreme of screams, when it’s probably getting real enough in there that I should pop my head in anyway. But the regular playful squeals that are the soundtrack of my life? Gone for a blissful few minutes. Jaymi: My grown-up-size Chicken Nugget meal is big enough to split with Abe, so Lila doesn’t have to LOSE HER MIND when I suggest she share the french fries she was never gonna eat anyways with her brother, and I still only have to buy two lunches. Christine: LEGIT fruit cups. Yeah, this sounds like a sort of dud reason, but I have to buy my Gremlins 2 kids meals and with one I get a REALLY nice fruit cup. And I look like SUCH a good Mom y’all. Jaymi: There is a stool for my daughter to stand on while she washes her hands, so I don’t have to hold her awkwardly while holding Abe and hearing her yell about how she’s never ever ever gonna wash her hands. Christine: Two words: Mobile ordering. Step one: Download the app. Step two: order from your seat while the kids play in the play area. Because let me tell you, wrangling three kids in line for food is a nightmare. Plus, I earn free food using the app, so cheapskating for the win! Jaymi: Those disposable placemats for the kids. I’m not opposed to putting his food straight on the table, but I get to avoid the comments from other people who ARE opposed when I use these bad boys. Christine: Seasonal milkshakes. Specifically peach milkshakes during the summer. I’m a sucker for a limited time offer like all things pumpkin in the fall, and their milkshakes are BEYOND. Jaymi: They let you trade the kids’ meal toy for ice cream, so A.) The kids get ice cream! We get to prolong our stay! and B.) I don’t end up with junk toys scattered all over the house. Christine: Everyone else loves Chick-fil-A so when I’m desperate and alone and need another grown up to witness my day, it’s pretty easy to get a partner in crime. Jaymi: My best friend Mark works there. He is only my best friend because he works at Chick Fil A, but STILL. Basically, Chick-fil-A is our everything. Our watering hole. Our recharging station. Our happy place. So go ahead, take all our money. It’ll be worth.every.penny. I ADORE Chik-fil-A. The app gets me free food. Curbside pickup if the toddler falls asleep enroute. And we get BOOKS instead of movie tie-in plastic crap. ALL OF THE YAAAAASSSSSS. I too am in love with Chic Fil a. One time, we stayed for three hours. Not kidding. My fave: they have filled my Diet DP for me in the nick of time more than once;. Daniella and I once stayed so long I think they considered charging us rent, haha! My husband was working late and hers had just gone to work so we figured we’d stay FOREVER. Like late lunch straight through to dinner! I mean, yes, I loved it, but so did the kids!!! So who were we to deny them??? Omg Chick-fil-a has been my weakness this pregnancy! I could go just for the fries alone! YUM! So true. It’s hard to beat a good waffle fry. This post made me laugh. We don’t have Chick-fil-A here at all. But man, I wish we did now. Definitely wanna try a peach milkshake. Ahh, I’m so sorry for you! The peach milkshake is for sure a thing of beauty. I love Chick-Fil-A! My daughter loves the playground and it’s one of the only places where she’ll eat basically anything we order from there.